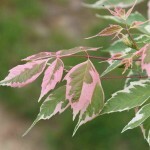 A small rounded tree with white and green variegated foliage. The new growth has bright pink added to the variegation. Fall color is greenish yellow. 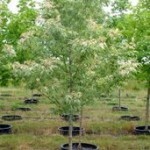 It is a fast growing and highly adaptable tree. The variegated foliage does better with protection from afternoon sun. It is tolerant of drought, clay soil, wet soil and other adverse growing conditions.